Attention! English version of the site is under construction! Внимание! Англоязычная версия сайта находится в разработке! Perm State Institute of Culture is one of the most promising and dynamic higher schools in Perm Territory. Those graduates of schools who seek to realize themselves in creativity and the humanities willingly connect their destinies with the Institute. The higher school which was originally called Perm State Institute of Culture was established in 1975 with the aim of training professional staff for regional cultural institutions: heads of houses of culture and clubs, librarians, organizers and masters of ceremonies for festivals, musicians, and choreographers. The first rector of the Institute was Zinaida Vorobyeva, who was leading the higher school for 21 years. 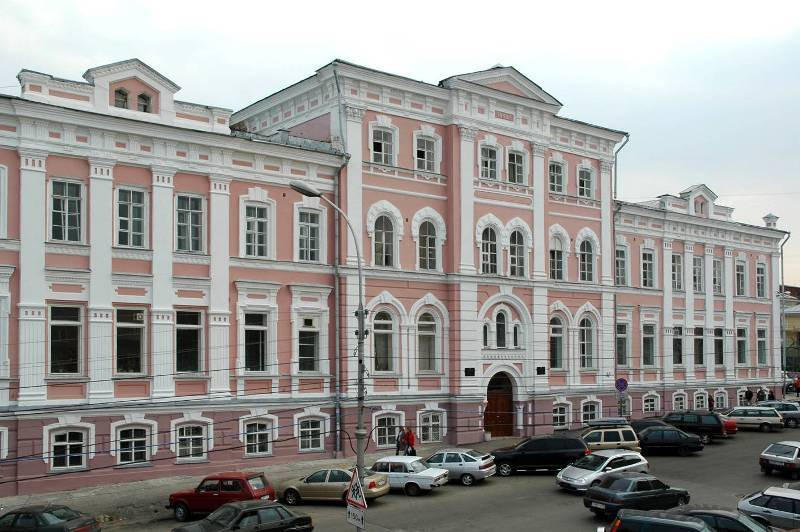 In 1991, the higher school was renamed the Perm State Institute of Arts and Culture. From 1996 to 2013 the Institute was led by Professor Eugene Malyanov. Since 2002, the Institute has opened a full range of specialties of professional musical art: musicology and music applied art, music instrumental art, vocal art, conducting, musical theatre art, the art of concert performance. In different years, such outstanding figures of culture and art of Perm Territory as I.T. Bobylev, K. I. Kudryashova, L.V. Mosalova, L. I. Futlik, L. A. Solyanik, E. V. Oparina, V. V. Elin, V. G. Munster, E. N. Shirokov, N. F. Abt-Neifert, V. S. Stefanova, E. S. Solomenny and others worked at the Institute. In 2013, the Institute received a new status and became known as the Perm State Academy of Art and Culture. The Academy was headed by Honored Cultural Worker of Russia, prize winner of international competitions, prize winner of the Russian Performing Arts Foundation (Moscow), prize winner of Perm Territory award in the field of art and culture, Professor Lyudmila Drobysheva-Razumovskaya. During 2013, a new effective management structure was created at the higher school. The rectorate structure was optimized, there appeared research activity department, the department of cultural and educational projects management, the department of extracurricular and educational work, information technology department, and the press service. A significant achievement of the higher school was the creation of the Conservatory in 2013. This change ensured the involvement of leading Russian and international performers in the teaching staff of the higher school. This made it possible to organize and hold international competitions and festivals of the highest level. Since 2013, the Institute has successfully developed cooperation with foreign institutions of culture, universities and creative centers, namely: Leibniz University (Germany), Olivia Gorra Cultural Centre (Mexico), the University of Novia (Finland), the Belarusian State University of Culture and Arts (Belarus), the Kazakh National University of Arts (Kazakhstan), Cultural Center 105 in Koszalin (Poland), the Belarusian Academy of Music (Belarus), Norwegian ballet school (Norway), Italian-Russian Association "Cultural world" (Italy) and others. In 2015, the Institute was given back its historical name. Today the Institute is developing rapidly. New directions of training have been opened, new faculties have been created, and the highly professional research and creative teaching staff of the higher school is being formed. Today the Institute employs outstanding figures of culture and arts, People’s and Honored artistes, heads of theatres and creative art groups of the city and region: V.V. Danilin, B. L. Milgram, P. A. Pechenkin, S. P. Fedotov, V. V. Perova, I. R. Kotelnikova, L. A. Petrova, T. A. Kazarinova, M. M. Skomorokhov, V. A. Novick, L. F. Ivonina, V. A. Iliev, T. P. Zharkova, V. I. Platonov, and others. The modern structure of the Institute includes 2 faculties (the faculty of cultural studies and socio-cultural technologies and the faculty of arts) and the conservatory. The faculties and the conservatory train the students in more than 30 main educational programs of the Bachelor’s degree, among which are Tourism, Documentary and Archival Science, Theory and History of Arts, Cultural studies, National art culture (profiles: Management of choreographic amateur group, Management of amateur theater, Management of the studio of cinema, photo and video art, Theory and history of national art culture), Social and cultural activity (profiles: Social activity management, Socio-cultural animation and recreation), Directing theatrical performances and festivals, Library and information activities, Choreographic performance, Musical art of the variety (profiles: Instruments of the variety orchestra, Pop and jazz singing), Musical-instrumental art (profiles: Piano, Organ, Orchestral string instruments, Orchestral wind and percussion instruments, Accordion, button accordion and string plucked instruments"), Vocal art, Art of folk singing (profiles: Choral folk singing, Solo folk singing), Conducting, Musicology and musical-applied art (profiles: Musicology, Musical pedagogy). In addition, students are trained for the specialties Acting art (profiles: Actor of the drama theater, Actor of puppet theater), Painting. There are programmes for Master's degree: Cultural studies, Social and cultural activity, Musical instrumental art (profiles: Piano, Organ, Accordion and stringed plucked instruments), Musicology and musical-applied art. One of the important directions of the development of the Institute at the present stage is to support scientific and creative schools and major creative and scientific events. The Institute annually hosts international and national conferences, open lectures and round table discussions. The most famous of them are All-Russian conference (with international participation) "Dialogues on Culture and Art", All-Russian conference in the framework of the forum of national unity "Problems and Prospects of Implementing the Strategy of State National Policy" which is held with the support of the administration of the Governor of Perm Territory. Today, the Institute employs the scientists recognized by the international scientific community. Among them, the head of the Department of Cultural studies and philosophy, Professor Oleg Leibovich, engaged in the research on the history of Soviet everyday life and the history of Stalinism; Professor of the Department of Cultural studies and philosophy, one of the leading Russian religious scholars Matvey Pismanik, the head of the Department of Humanities, Professor Leonid Dorfman, the founder of his own scientific psychological school, dealing with the issues of creativity; the head of the Department of History and theory of music, Professor Nadezhda Petruseva, who studies the issues of contemporary music and regional music culture. The scientific achievements of the Institute stimulate the research interest of students. Thanks to this interest there is an annual scientific and practical conference of students in PSIC. Creative and performing activity of the Institute is the most dynamically developing direction. The main priority in this area is the implementation of socially significant creative projects and positioning of PSIC at All-Russian and international levels both as an expert center and the center for continuing art education. Every year, more than 200 creative events are held at the Institute, within the framework of which the higher school is visited by well-known foreign and Russian masters of arts. The most significant events are International multi-genre competition named after A. Nemtin, International spoken-word artist competition "Live Russian Word", International competition of folk instruments performers "Prikamye", International solo singing competition "ACADEMIA", Regional concert subscription "Creativity of youth to the native city and the region!". The teachers and students of PSIC annually become winners of professional competitions of various levels. The Institute actively develops student self-government with the help of Youth theatre "Academia", Students creative association, Students sport club "Culture", media center and volunteer teams. Scientific and educational activity of students would be impossible without the provision of modern technologies used in specially equipped classrooms, all necessary musical instruments, as well as the creation of comfortable living conditions in the student halls of residence located in the city center. The graduates from PSIC speak about the successful activity of their alma mater glorifying the Institute, the city, the country on the world stage. The most famous of them are People's artiste Vladimir Danilin, a world-famous magician, prize winner of numerous international competitions; Evgeny Panfilov, the creator of the world famous original school of modern dance and theatre ballet; Sergei Rainik, the artistic director of the theatre "Evgeny Panfilov Ballet"; Sergey Fedotov, the founder and artistic director of the theater "U mosta", which has also acquired national and international acclaim for its original productions of plays by Russian classics and contemporary foreign playwrights; Galina Kokoulina, the director of the Perm Territory Philharmonics; Olga Vyguzova, the founder and leader of the academic choir "Mlada"; Vitaly Kovalenko, a pianist and jazzman; Irina Kuleva, the founder and leader of ensemble "Voskresenye"; Natalia Buklaga, a soloist of Perm Opera House; Eduard Morozov, a soloist of Perm Opera House. Besides, the graduates from PSIC are the following TV and film actors Svetlana Permyakova, Zhanna Kadnikova, Anton Bogdanov, Ilya Ilyinykh, Vladimir Smirnov, Marina Fedunkiv, Vladimir Selivanov, known for their performing in TV show "Club of the cheerful and sharp-witted" and popular TV series.